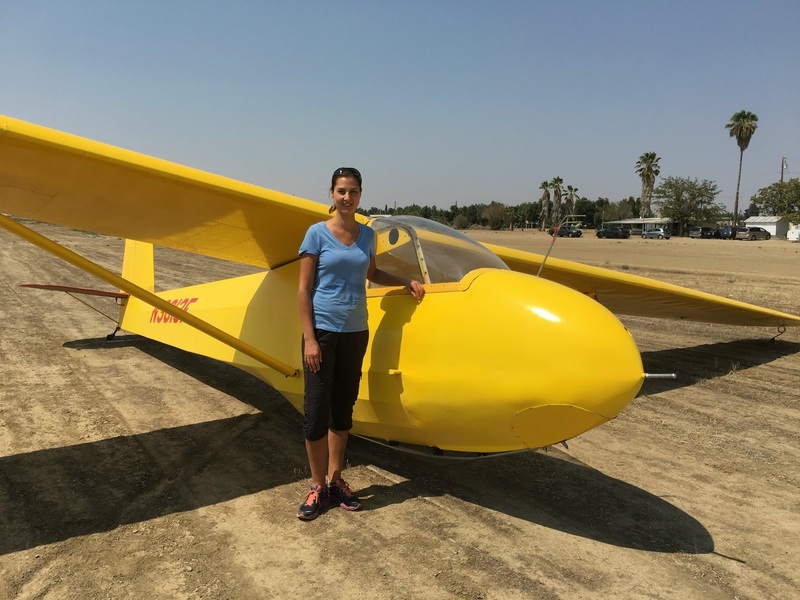 Central California Soaring Association: SATURDAY, August 20, 2016. Hot but relatively busy. New Student Beth Platz. SATURDAY, August 20, 2016. Hot but relatively busy. New Student Beth Platz. Visibility: 10 miles max, in smokey air. Mtns barely visible. Wind: Light and variable from N about noon. Comment: No tow pilot until after noon. The day was hot again but not as hot as two weeks ago when the wind felt like someone had turned on a hair dryer and pointed it at my face. There were a surprising number of members and visitors here today some of whom didn't fly but volunteered to help in other areas, like making a fuel run or just helping launch the gliders. 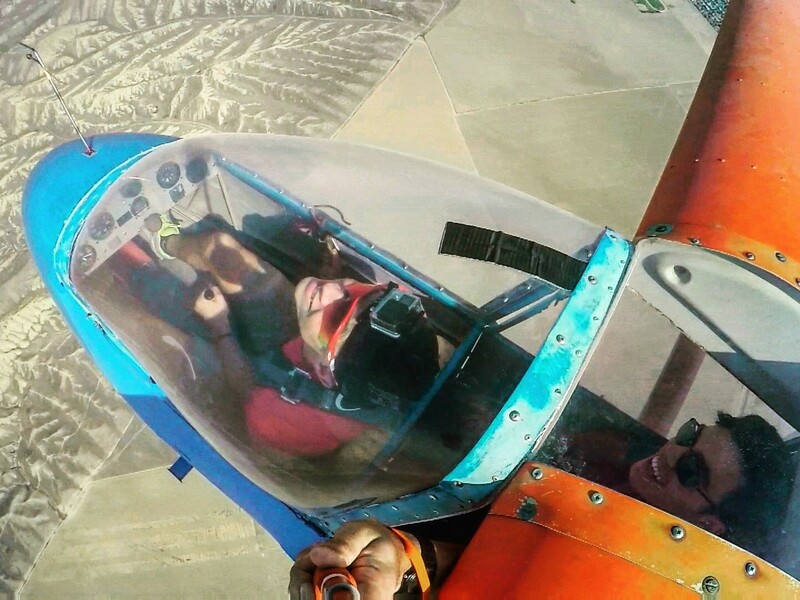 Sergio Grajeda flew again and is getting much closer to his written test and then checkride. Alex Caldwell showed up later on thinking he could help with the towing. 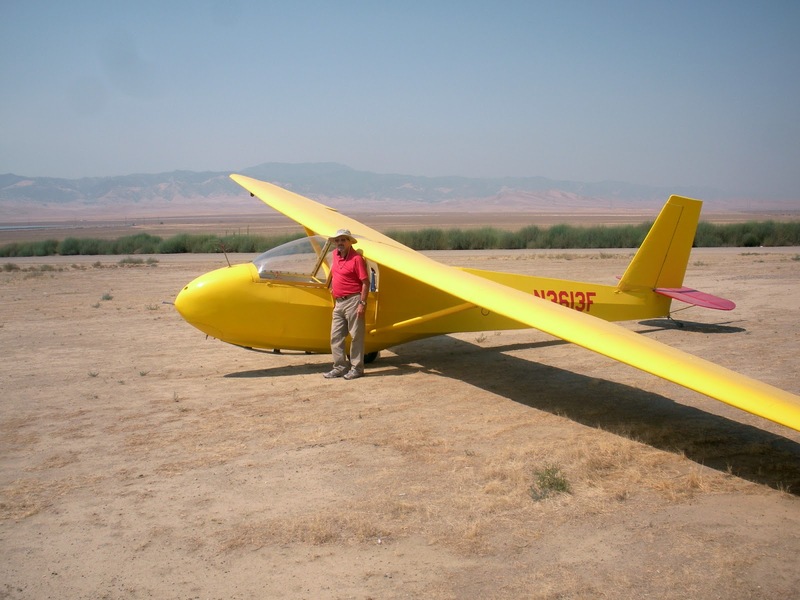 Mike Paoli was working on the hangar for his glider that he purchased from Jan Zanutto. 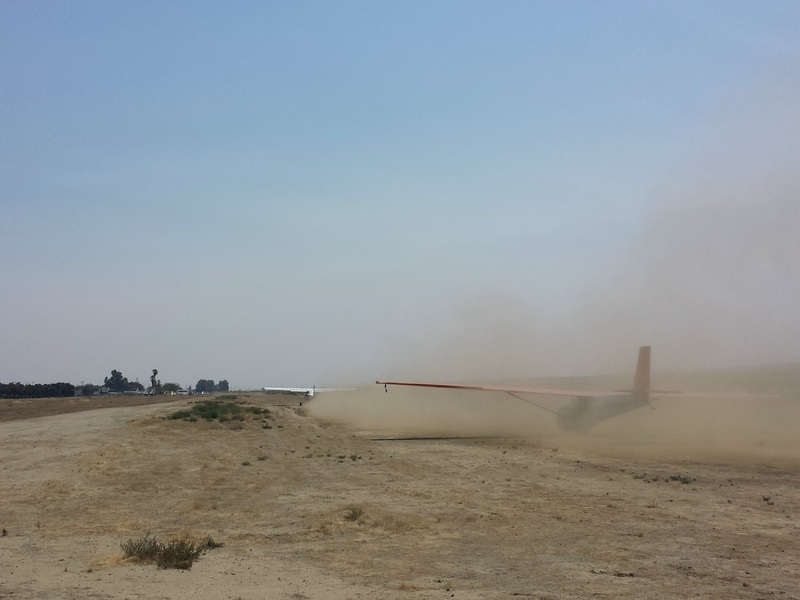 Richard Walker flew his Schweizer 1-35 for a little while, then landed hot and dry from not getting too high above the field. Don Flinn flew with Carsten Moeller, then signed him off for solo as Carsten had amassed 1284 flights over in Europe. Don also flew with Tiffany Nguyen who is on her way in flight training for her license. Yutaka Buto also arrived and flew the 1-26 on a nice long flight, getting up over 4000 msl or higher. He, like everyone else, came down sweaty and thirsty. I was again worried that the wildfire smoke would put a damper on a respectable RASP forecast, but it turned out to be very soarable, just like August 6th with Jeff. I started with a surprisingly smooth transition into the mountains, taking the first thermal off tow up to 5,000 ft and then pressed into the mountains, peaking over Black at 9,300 ft. It took the the first 2/3 of the flight to find the convergence line after exploring north and south. It ended up being marked later in the afternoon by a wall formed from the wildfire smoke in the valley alongside clearer marine air pushing in from the west. Overall a really good (but lonely) flight! Martin Caskey arrived early and did a few hours work on his Nugget. He didn't fly but had other items he needed to accomplish while here on the field. 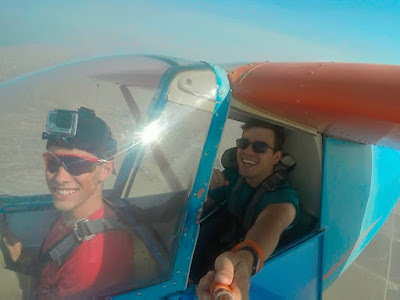 Luca Soares and I flew the Big Bird, and because of the rough air, we couldn't do a few maneuvers so we opted for catching a good thermal and heading high. 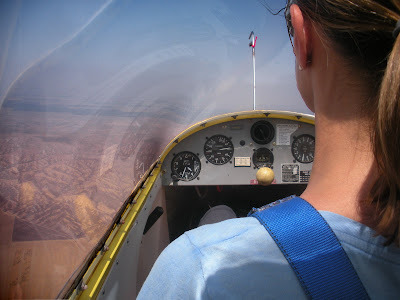 When we passed 5600 msl, we leveled off and flew around just enjoying the cool air aloft. Luca is doing very well, especially on thermalling so I'm comfortable with him doing all the flying. He'll solo soon and then he'll really have fun flying without that instructor nagging him from the back seat. I took two new people aloft on Saturday. Charlie Cook, my roommate from my first year at Cal Poly was first. We were aloft for 1.3 hours and I gave him an introduction to the flight controls on Condor at my apartment before we came out. 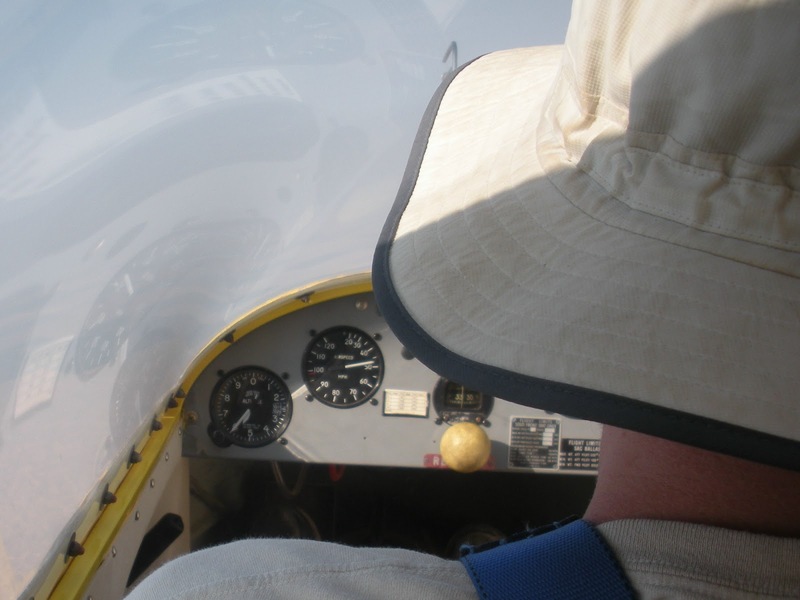 It showed when we got in the air because he was able to maintain airspeed and bank angle when I gave him control. We thermalled with Yutaka up to nearly 5000' MSL. ride in a small aircraft. She wasn't feeling super well. I could tell from the back seat that she was uncomfortable with the motion of the aircraft, so we cut the flight short after 20 minutes. In the late hours of the evening, I did two rope breaks in the 1-26 working towards the required 20 flights needed to fly high performance. I have 11 logged so far. 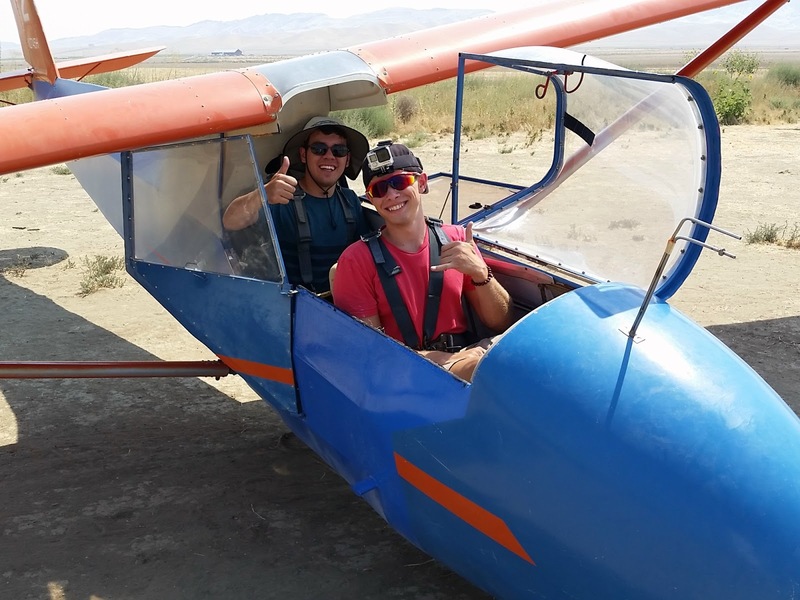 Troy's buddy from school, Charlie Cook about to take his first glider ride. The selfie world has invaded the soaring world. 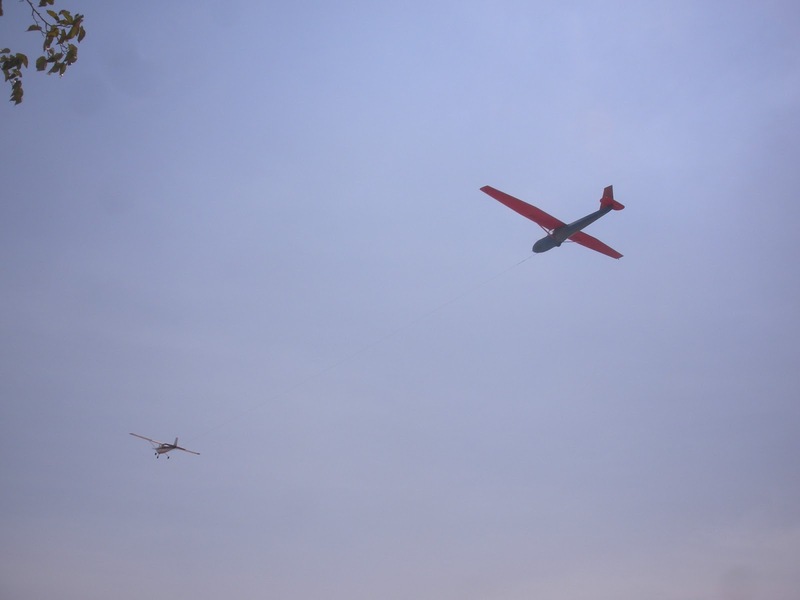 I wonder who was flying and watching for other gliders. I guess Charlie has the stick in hand and hopefully looking out for other gliders. Troy and Charlie sharing a thermal with the 1-26 piloted by Yutaka Buto. Peter Suddjian came back to Avenal after a multi-year layoff. 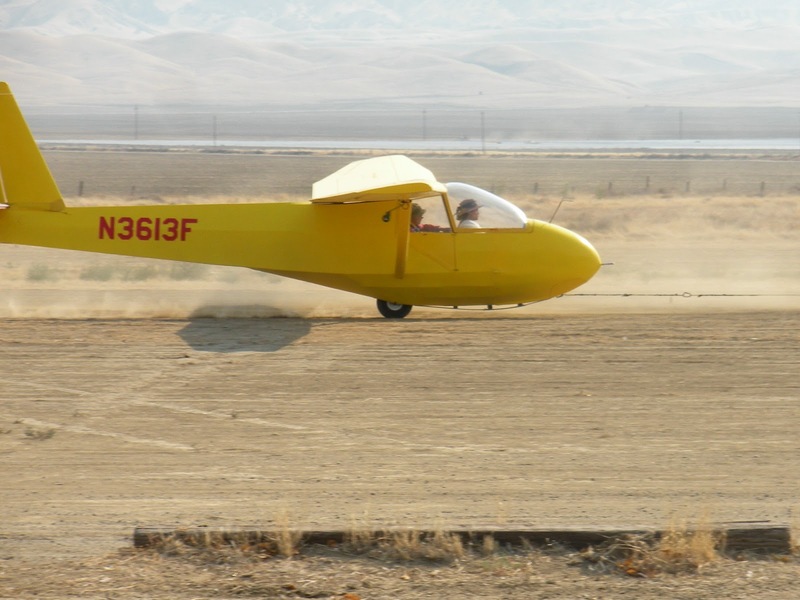 Pete's a long time power pilot from the Fresno area, owned several aircraft, flew a lot and a lot of places, but has decided since he recently sold his airplane, he'd try flying gliders. 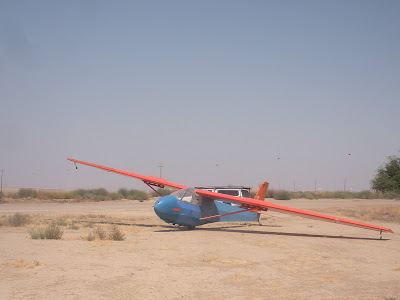 Pete, of course, had no trouble getting the hang of glider flying but the hot and rough air made for some frustrating moments. Those disappear when the air cools down and the visibility improves, which it will in just a few more weeks. Beth Platz, an M.D. from Fresno, decided to learn to fly. That doesn't surprise any of her friends or family since she's been on the cutting edge of other learned skills ever since her childhood. A few visits to the local donut shop where she met a group of friends including me, and enough talk about gliders convinced her that it is a skill she wanted to pursue. She finally found her way out to Avenal today, and had to wait a couple of hours since our lack of a tow pilot put us all behind the schedule. Once in the glider, all minor anxiety vanished and Beth was calm, cool, and collected. Once off tow, I briefly instructed her on the basics of flight controls and she took it from there.We caught a nice thermal, and Beth thermalled the entire flight of 40 minutes ( I probably should have cut that down to 20 minutes but she was doing so well I didn't have the heart to stop her progress). In the process she gained 1000 feet of altitude, going from 2700 msl to 3700 msl where we finally departed the thermal for some relaxing straight and level flight. 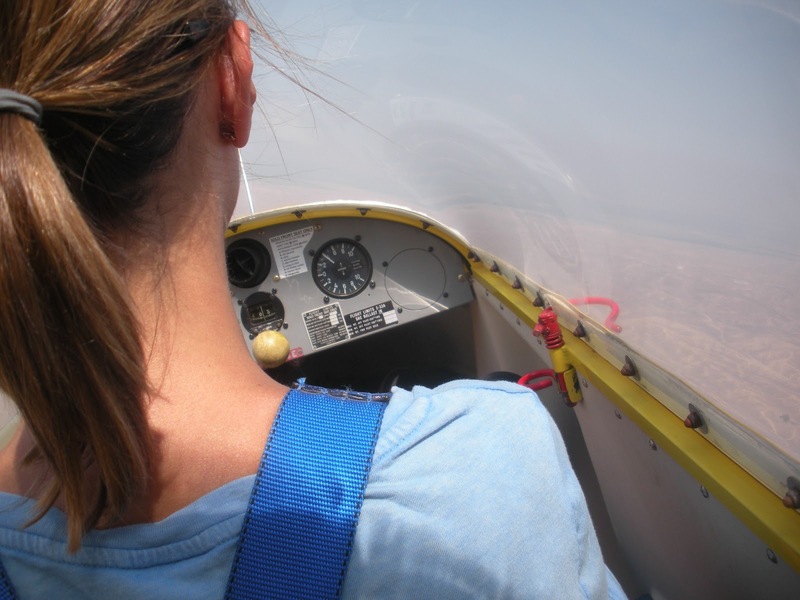 It is perfectly clear to me that if she decides to pursue her Private Pilot's License she will have no difficulty at all and will enjoy every minute of the process. That's especially true when the weather turns cooler and the sky clears from all the fires here in California. Then the real fun begins. 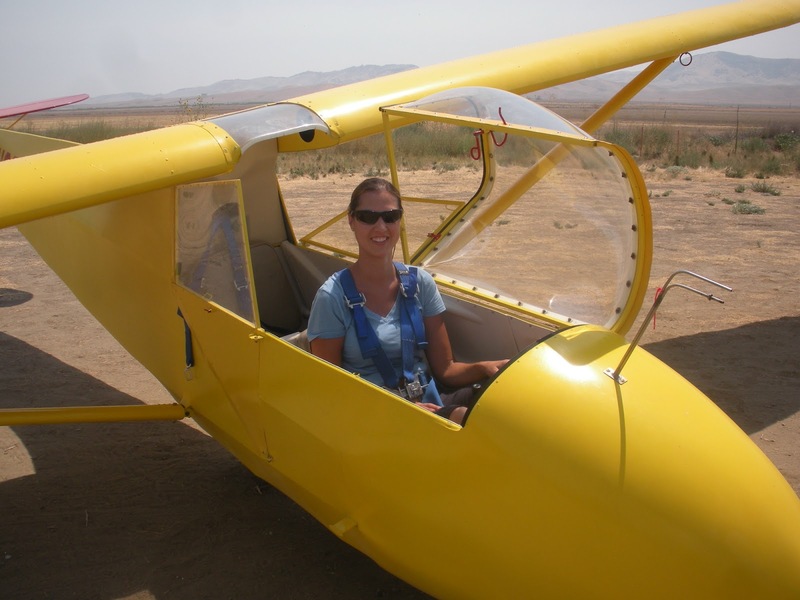 CONGRATULATIONS ON YOUR FIRST GLIDER FLIGHT, BETH !!! Or should I say, Miss Spectacular !! The Orange Crush waiting for a tow pilot to carry Don Flinn and Carsten Moeller aloft. 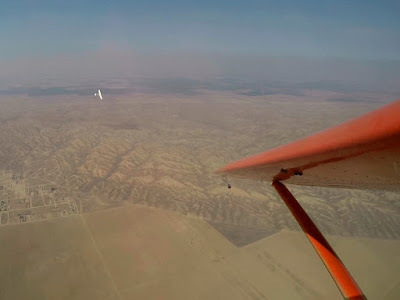 "a cloud of dust, and a hearty Hi-yo, Silver" Carsten Moeller finally solos a glider in the U.S. on his 1285th glider launch. Thanks for the tows and for creating an excellent weekly record of everyone's activities. To explain, since no tow pilot showed up by noon, Don Flinn and I decided to tow for one another's students. 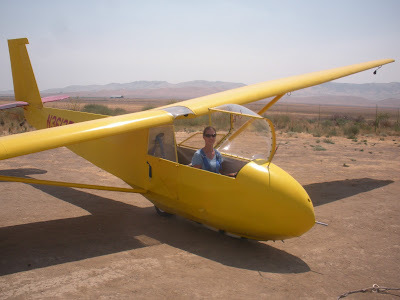 In this case, I towed Don along with Carsten and then Carsten for his solo flight in the U.S.
Peter Suddjian on his second glider flight lesson. He's a new CCSC member and already a long time power pilot. Not certain who's flying the Orange Crush but perhaps it is Troy Wollman. 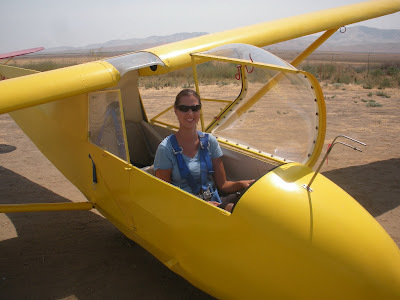 Beth Platz taking her first glider ride ever. 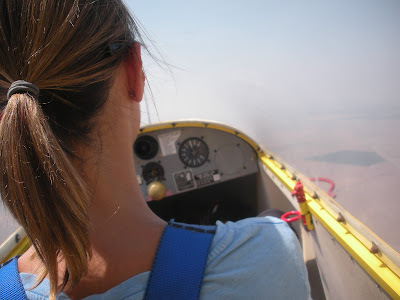 Not at all nervous, just excited to be flying gliders for the first time. We needed two pictures to make sure Beth's friends and family saw her doing another wild and crazy thing. 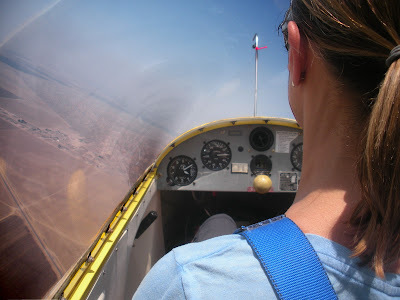 Beth is doing all the thermalling and here she is gaining altitude at 400 feet per minute (instrument on right). Here Beth is steadily gaining altitude in a nice left bank and passing 3160 msl altitude (instrument on left). We released at 2700 msl and here's Beth thermalling towards 3600 msl, and finally reaching 3700 msl. This shows how well Beth thermalled, catching and staying inside a thermal going up at 600 feet per minute. Finally, getting weary of circling and with poor visibility, we decided to fly straight and level. Beth Platz is one happy young lady after gaining 1000 feet of altitude on her first flight lesson. Luca Soares reaching 5600 msl at which point we simply flew straight and level enjoying the cool air. Luca couldn't resist working another thermal as we descended intending to land after a very long, 1.2 hour flight. 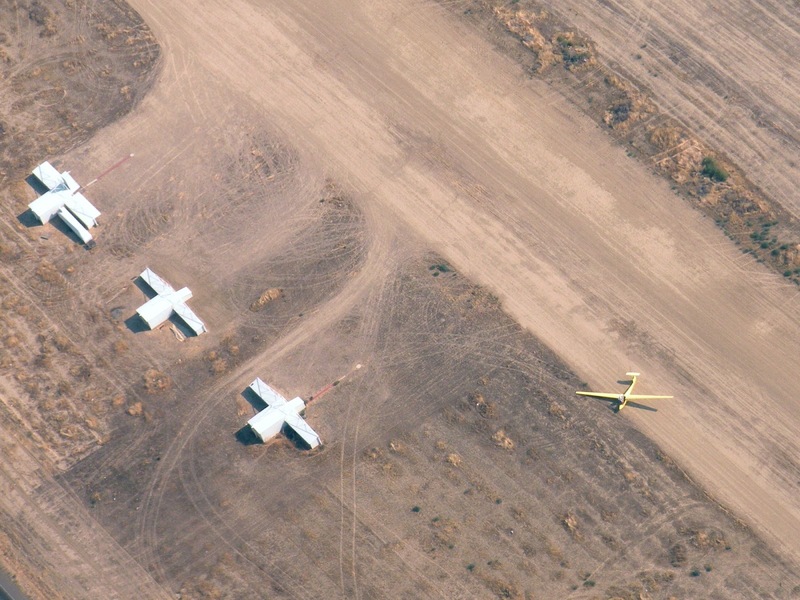 The gliderport from above. Note Richard Walker's Schweizer 1-35 just landed and to the side of runway 31R. Here's a better view of Richard just as he landed after a mostly lower level flight. One of the last flights of the day with Alex Caldwell flying with Sergio Grajeda in Big Bird. 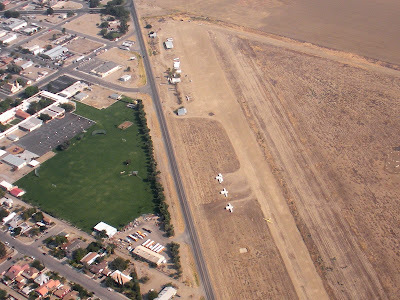 The weather is beginning to cool off and we are entering the best time of the year for flight training. If you've ever thought about learning to fly, now is the best time to start the training cycle. 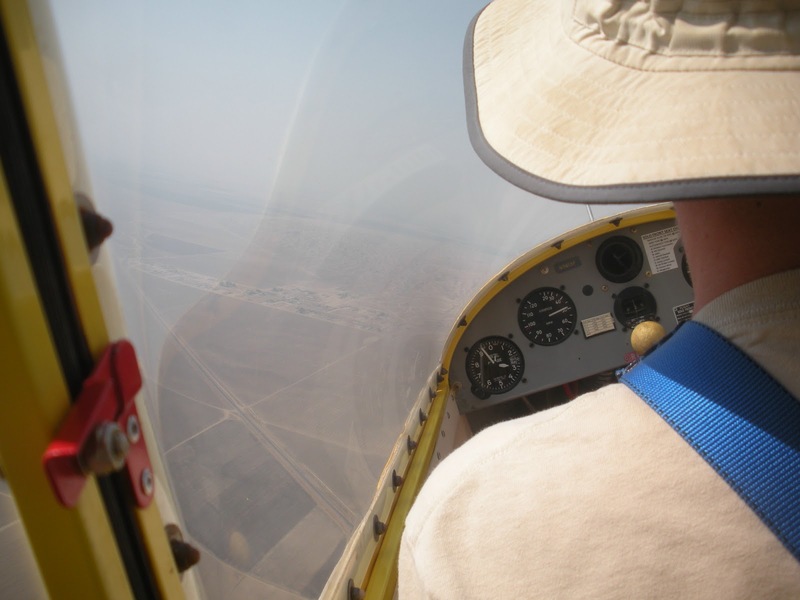 Cooler air means smoother air and makes it easier to learn the fundamental maneuvers required for your glider license. There is no better way to begin a flying career than in gliders. Then you can progress towards power training and go on from there. 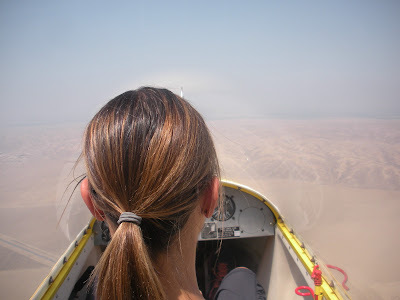 Those who've never flown in a glider are missing a really amazing experience. Even if you fly only once, just do it, as the Nike ads proclaim.